We all have seen at least one silent or black and white movie in our lives and it is needless to say that they have a completely different aura coming from them, giving a nostalgic feeling but can yet be so positive and humoristic. When it comes to online games, black and white design isn’t very common and especially the inspiration theme of a silent movie. 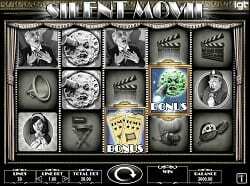 That mixed together is something we haven’t seen before in the gaming industry and now we can in IGTs latest game release, which has a great corresponding name, Silent Movie. In this video slot game players will see a black and white color scheme and the only colored things are the bonus symbols which we have to say is very convenient. With the black and white design the game focuses on the most important part, which is getting the bonus rounds, but at the same time the base game looks dark and sophisticated. Silent Movie is the newest member of the IGT family. They are a really well known gaming provider in the industry and players love their innovative slot games with great graphics. IGT has many fascinating games in their collection and we’re happy to see them adding another great game to the offer. When it comes to technical aspects, this game is quite simple. It has 5 reels and 30 pay lines with the standard 3 rows. This game will attract both low rollers and high rollers, as players can bet from only $0.30 to $90 per each spin. This game is a perfect example of fun, entertainment and sophistication. This game has wild symbols that appear both on base game and in the free spins substituting for all symbols except the bonus ones. This feature always comes in handy as it helps to make and improve winning combinations. But the main stars of the show, or in this game, are the free spins bonus rounds. There are four free spins bonuses and they all have different movie as inspiration. Even the road to getting the free games is really exciting. To trigger the free spins players don’t need three scatters symbols like it is mostly required in slot games. However players do need 2 bonus symbols matched with one of the movie bonus symbols. Depending on which movie symbol lands the corresponding movie free games feature is awarded. Then the player will enter an old movie theatre and a short clip will be shown that gives you a correct impression of the silent movie you will be playing. The road before playing the free games doesn’t stop there, before the free games there will be 3 symbols and you will have to pick one of them. They will reveal either a free spins amount or multipliers. So the features start with A Muddy Romance bonus where players get from 6-12 free spins and an extra payout for scatter symbols. There are also the Dr Jekyll and Mr Hyde bonus, where players get from 3-6 win spins who are multiplied x3. Keystone Kops bonus will give you 10 free games with x2 to x5 multiplier that will double in the last five spins. For last is the A trip to the Moon bonus where 10-15 free spins are given with extra wilds. The variety of bonuses are very impressive and they all stand out for different reasons so we are sure that they can bring impressive winnings. Silent Movie has a big winning potential thanks to the high number of pay lines and many bonus features that the player can trigger. Even though the maximum promoted payout is 250,000 coins, wins of over 1,000 x bet are possible to land in any of the bonus features available. Silent Movie is an unforgettable game as it feels very authentic and with the sounds and movie clips it truly gives a feeling like you are a part of the last century and are visiting the theater. Even with the nostalgic appearance, the game still gives positivity and entertainment. What’s also great is that the design is as strong as the bonuses. It’s great when we see 2 bonus rounds available in a slot game, but here with 4 bonuses in total players will never get bored, especially because the extra features for each feature makes them more generous and adds more winning potential. If you want to have a little retro entertainment with great winnings, then Silent Movie is a great fit for you.